In October 2022 the binary asteroid system 65803 Didymos will have an exceptionally close approach with the Earth flying by within only 0.11 AU. ESA is planning to leverage on this close encounter to launch a small mission of opportunity called Asteroid Impact Monitoring (AIM), its mission goals are threefold. First, it shall carry out technology demonstrations enabling future science and exploration missions, with a focus on telecommunications. In addition to this it shall perform the required measurement to validate DART’s asteroid kinetic impactor deflection demonstration, and finally it shall obtain data of scientific significance in the study of the Solar System and its dynamical evolution. The AIM project is in its industrial phase-A/B1. In parallel to this mission assessment work, ESA is conducting definition studies for the main elements in the AIM payload, including the Cubesat Opportunity Payload Intersatellite Networking Sensors, COPINS, the cubesat-based experiment. COPINS consists of a set of two CubeSat dispensers with a capacity for 3 units each and the associated CubeSats that could be deployed and operated as a network of sensors or as separate experiments relevant to the AIM scientific and asteroid mitigation objectives. ESA has released a technical challenge driving new mission concepts involving these CubeSats operating together or individually in interplanetary space in support of AIM’s scientific objectives. 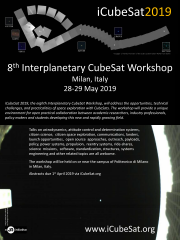 Therefore the objective is to investigate concepts which take advantage of exploiting distributed networked or single CubeSat systems in order to provide significant contributions to AIM’s asteroid research and mitigation objectives. After an initial measurement phase, the AIM spacecraft would be maneuvered to within 10 km of the binary asteroid. Before DART’s impact, the COPINS would be released, and the main spacecraft would then retreat to a distance of 100 km, ready for the impact event not more than one month later. The CubeSats would perform their mission up to 2 months after the impact date, i.e. for 3 months in total, using an inter-satellite link with the main spacecraft’s communications system for telecommand, housekeeping and payload telemetry data relay with the ESA ground stations network. An overview of science opportunities provided by such deep-space CubeSats will be given together with the overall operational concepts.